Since 2011, we have had a strategic partnership with Jackson Stevens Résumés. Your résumé needs to make a strong first impression, we endorse the JSR system. Click here to get your free critique. Make sure to tell them we sent you! We welcome you to review free-resources from Fatemah Mirza from CareerTuners. Fatemah Mirza is an award-winning, three-time certified resume writer and job search coach. Her library of free resources has been utilized by more than 3000 professionals. 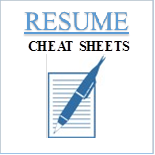 Click here to get your free resume cheat sheets.